Smart Metering Systems Market size will surpass USD 21 Billion by 2024, as reported in the latest study by Global Market Insights, Inc. Implementation of fiscal incentives along with the government plans to replace the existing meters will drive the smart metering systems market size. Several countries have enforced regulatory directives to accelerate the deployment of AMI meters as a part of their energy conservation initiatives. In 2016, the U.S. city of Berea in Ohio partnered with metering firm NECO and Badger Meter, a metering solutions company for the rollout of smart water meters project. The U.S. smart metering systems market is predicted to exceed USD 3 Billion by 2024. Stringent regulatory framework to achieve energy savings along with ongoing measures to replace the conventional meters will augment the industry landscape. For instance, the California Public Utilities Commission (CPUC) has sanctioned the investor-owned utilities to replace conventional meters with intelligent meters to ensure customer control over the energy usage. The Southern California Edison has been authorized by CPUC for the installation of approximately 5.3 million smart meters. AMI smart metering systems market is predicted to grow over 10% by 2024. Increasing adoption of automated technologies across energy utilities to ensure energy conservation, customer service improvement and load management will boost the product demand. AMI meters dynamically involve the end users to execute the consumption decisions and provide real time information regarding the energy usage. UK smart metering systems market will witness growth on account of rapid technological advancement along with growing adoption of sustainable systems. Introduction of automated data management systems across the metering industry will further fuel the industry growth. The introduction of intelligent metering system forms a fundamental part of the recent government policies aiming at the environmental sustainability and energy conservation. Australia smart metering systems market is set to expand over 16% by 2024. Introduction of government policies along with growing measures toward energy conservation will fuel the business growth. In December 2017, the government of Australia introduced Power of Choice reform which seeks to provide AMI meters to all electricity consumers across the region. Increasing number of utilities along with the integration of advanced ICT solutions for operations will stimulate the smart metering systems market growth. The rising demand for effective measurement, monitoring, and utilization of natural resources will further facilitate the large-scale deployment of these meters. 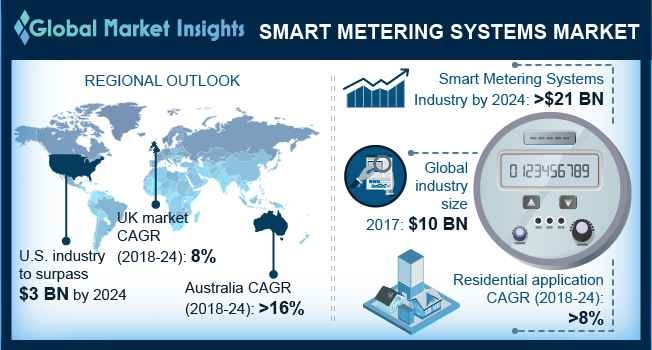 Key industry participants in the smart metering systems market include Apator, Circutor, Iskraemco, Kamstrup, Aclara, Sensus, Neptune, Osaki, Badger Meter, Honeywell International, Schneider, Itron, Siemens, and Landis+Gyr.